Running On Empty: Week #7 Done! 3.) I surpassed my monthly mileage PR with today’s run! #5 9:11 < It never fully recovered! 42:50 overall (8:32 average). Not bad considering the last two miles were run on a half-numb foot. I still haven’t figured out why this happens (and at random). And, I ate my Gu Energy gel at mile #2 (a little early) because I felt that I was bonking. 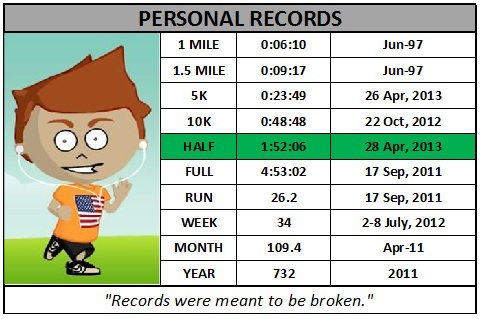 I guess my body was trying to telling me something…..
42:43 overall (8:25 average) Again, not too shabby! This is right at my goal pace (8:30)! I am pleased. I think the Gu Energy gel helped that day (I ate one an hour prior to leaving work). 6.2 miles @ 52:47, an 8:30 pace (14 seconds off my previous 10K PR, set on 17 Mar 2011). Again, not a bad run. I need to do something different for my next run though. I am getting pretty tired of running the neighborhood over and over again (I needed some new scenery). I’ve got some ideas but I’ll need to plan more (TBD). One thing’s for certain: the Gu energy gel that I ate during mile #3 of today’s run was awful! Gu’s Roctane line-up packs additional ingredients that are supposed to help prevent muscle breakdown and fatigue during workouts. It has added caffeine (for energy) and histidine (the amino acid that slows lactic acid build up). I personally didn’t notice a difference (from one packet) and I was not at all thrilled with the flavor (blueberry Pomegranate flavor). I don’t think I’ll be buying this flavor again….. I ordered several other Roctane flavors (currently in the mail) and will critique those when they arrive. Well, that’s it for week #7. I will begin week #8 on Sunday. Take care and thanks for the visit. I hope the weather is warmer wherever you are (because it stinks here). 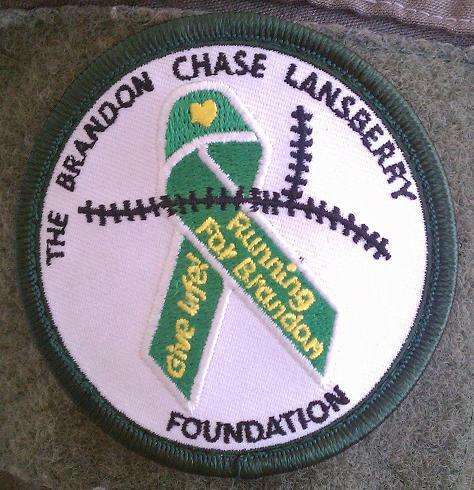 PS: The BCL Foundation patches arrived this week (pictured below)! This was a work in-progress over the course of the past two years. There were a couple of folks directly involved with the creation of this patch (you know who you are, and we thank you)! I plan on sewing these patches on my race jerseys with the intent to raise awareness for childhood cancer and organ donor programs. There aren’t too many Hepatoblastoma groups out there (and most people don’t even know what it is). Those Hepatoblastoma groups that do exist are very tight-knit communities (thanks for the support all, and continued prayers to you all)! Five weeks until the PIG! Thanks for the visit and be safe!